I am utterly thrilled. LIFE CLASS is the last book in my three book deal with Accent Press. It now sees the light of day in its new incarnation. "....kept me spellbound, unable to find a place to stop reading and therefore carrying on long into the night. I love it when a story does that for me and that's why it has to have five stars. Read it - you will not be disappointed." About art, life, love and learning lessons, LIFE CLASS follows four members of an art class, who meet once a week to draw the human figure. All have failed to achieve what they thought they wanted in life. They each come to realise that it’s not just the naked model they need to study and understand. Their stories are very different, but they all have secrets they hide from the world and from themselves. By uncovering and coming to terms with the past, maybe they can move on to an unimagined future. Her job had always had its lighter moments, but today, since she’d come back from her lunch break, her mood had plummeted. On the pin board above her microscopes, official instructions about hygiene, circulars, and timetables jostled with the cartoons and jokes members of staff had attached. Her contribution – NEVER TRUST A SMILING HETEROSEXUAL – was boldly inscribed on a Post-it note. Even though she’d become used to seeing it, it usually it made her smile. Now, it was neither funny nor relevant. She had only seen the patient’s back view but had recognised the boy instantly. And it was impossible not to start putting two and two together, given whom she’d spotted waiting in his car outside. Earlier, she’d walked back from the city centre, her mind buzzing, consumed by thoughts of the house, her mad offer for it … and its owner. She’d had to juggle with her bags, umbrella, and key fob to get the boot of her car open and stow her purchases. Just as she slammed it shut, the sun came out and a sudden flare off a puddle momentarily blinded her. She averted her eyes. In that instant, she recognised the man she’d been thinking about, sat in the car parked next to hers. What a comedown. But it didn’t have to mean anything. Perhaps it was just a bizarre coincidence. Even if they had come together, there were any number of explanations. Perhaps he’d come as a ‘buddy’, or in loco parentis to support the boy. She rubbed at her forehead. Why was she trying to convince herself that the obvious conclusion was the wrong one? And what was it to her, anyway? If you work in this field you can’t be judgmental, she reminded herself. Other people’s lifestyle choices are none of your business. 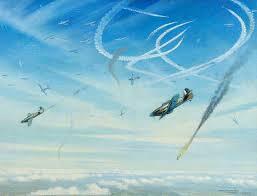 Who knew The Battle of Britain lasted for longer than one day? Not me. It was done and dusted in about an hour after Sunday lunch, wasn’t it? Whenever this pivotal moment in the war is mentioned, I always think of my parents. They had no connection with it other than it was fought above their heads, but for many years, my understanding of the battle was grossly distorted by an anecdote they told, which came down in family lore. It wasn’t until I was a grown up woman with a child of my own that it really came home to me how close WW2 was to my own life. Even though the world I grew up in was peppered with bomb sites, there were still ration books, and my parents’ reminiscences were full of stories about their wartime experiences, the war was somehow remote to me. It was long ago. The olden days. History. I never truly absorbed, on an emotional level, what my parent’s and grandparent’s generation went through during those years. But I am not writing this to expound on their heroism, or their contribution to the war effort. 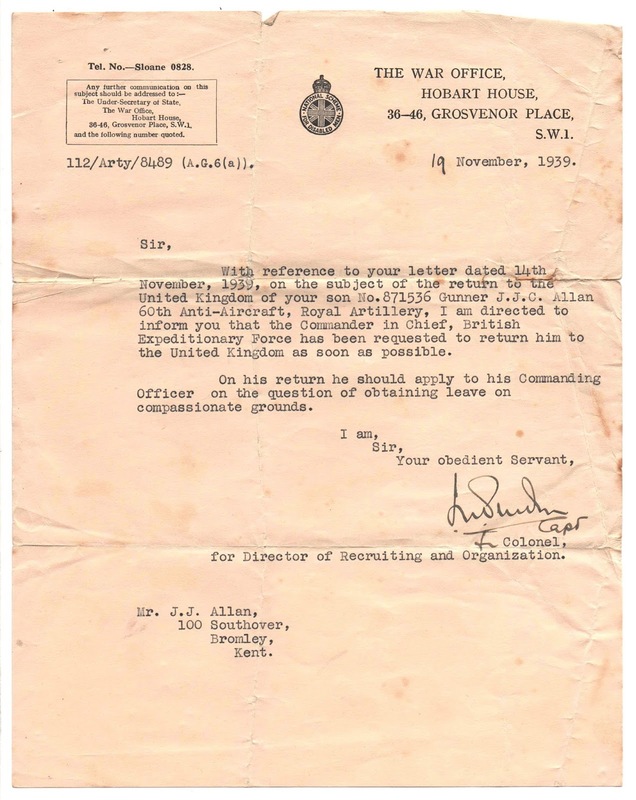 My father, John Allan, had what is known as a lucky war. It could have been very different. Before the war he’d joined the Territorial Army, but he’d lied about his age. When war was declared he was sent to France with The Expeditionary Force. 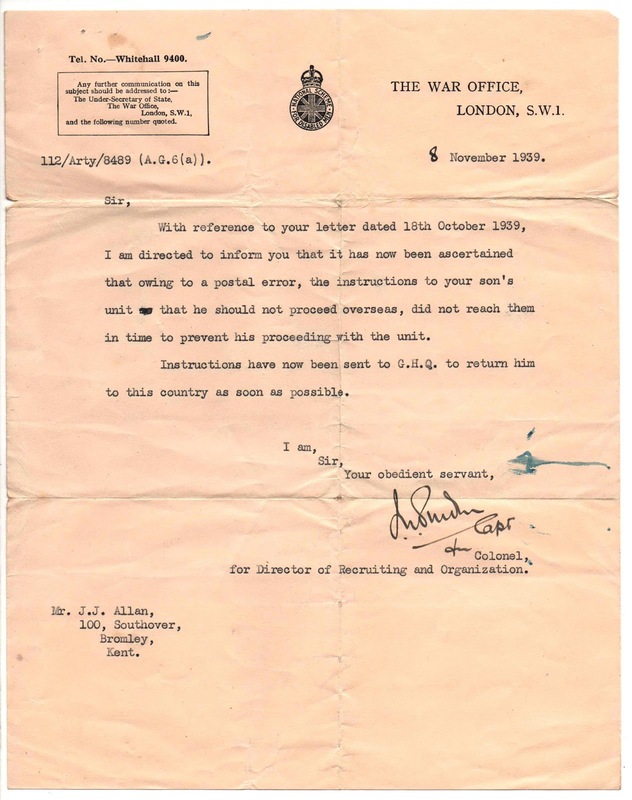 He was too young and his mother immediately wrote to The War Office informing them that a mistake had been made. It was a mistake which, in any other circumstance, might have passed with a shrug from the powers that be. But my grandmother was a woman to be reckoned with, and although I can’t know for sure, I guess she pursued this indefatigably, writing to them over and over again. Their simplest recourse, under the assault from Gran, was to give in; her son was sent home before the debacle of Dunkirk. 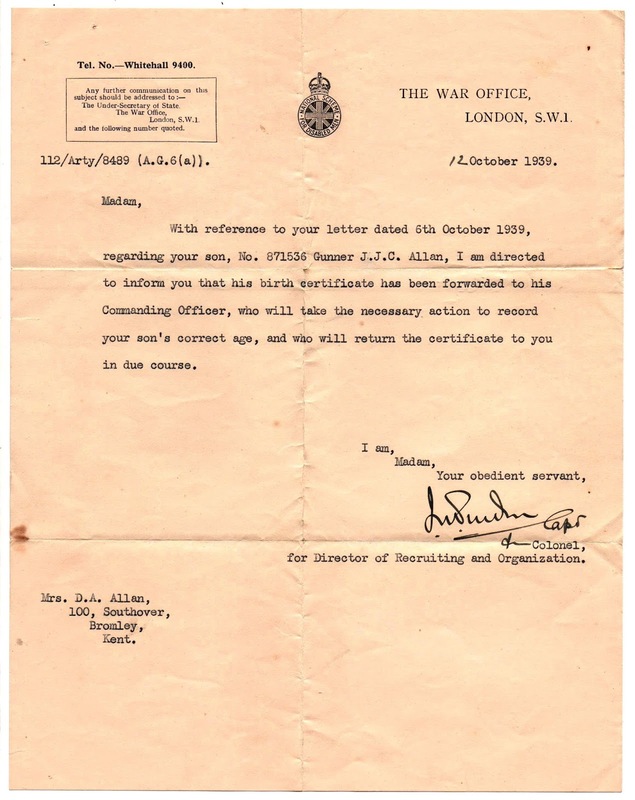 After my father died I found three letters from The War Office, which confirmed the story. My Dad then spent the remainder of the war posted to various locations inside the UK. For a long time he was in South London, first as a gunner on anti-aircraft gun emplacements, then his artistic skills were utilised in the making of plotting boards - I’ve always assumed these were used in planning bombing raids. He always claimed that one of the men he worked with, at this time, was Cecil Day Lewis. 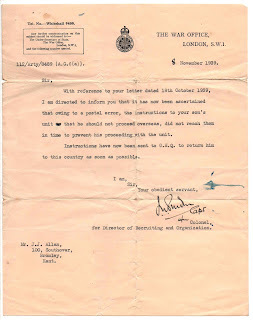 It has to be said that my father was an embroiderer of the truth but I have just Googled Cecil Day Lewis and apparently he worked for The Ministry of Information during the war. It is not a tremendous leap of the imagination to put the two men together at some point. 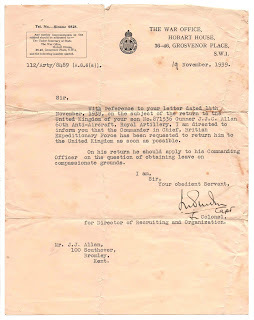 It was only after the war was over that my Dad was sent out to Germany with the British Army of the Rhine. My parents had just begun ‘courting’ as the war began. 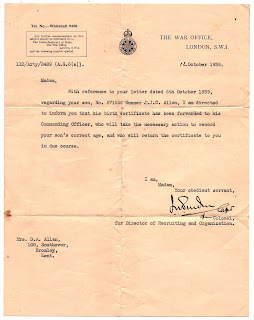 My mother, Irene Kelsey, wasn’t herself called up into the ATS for a couple more years, and so in October 1940 she was an eighteen year old, still at home in Orpington, with her parents and younger sister. And, very luckily, her nineteen year old boyfriend, my Dad, was stationed nearby and was a frequent visitor. Stubborn, fiery, and anti-authoritarian, my Mum, was also down-to-earth with a prosaic, matter-of-fact streak. Later, she was an early adopter of the underlying principles of Women’s Lib. It was a movement which confirmed instincts she already possessed. 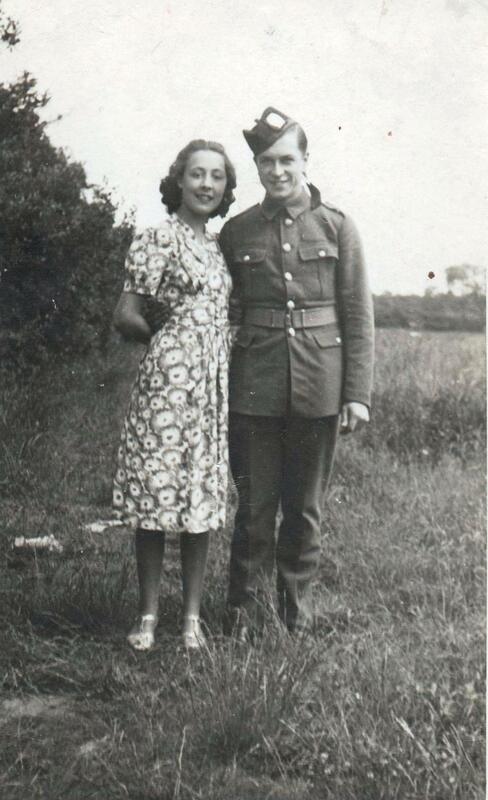 My Mum & Dad in 1940. Back to the war. It was a Sunday in October 1940, and my Dad was at my Mum’s home, to join the family for Sunday lunch. He loved my Mum’s parents, and loved his future mother-in-law’s cooking. The two men - my Dad and my Granddad - their bellies comfortably full of main course and pudding, got up from the table to go outside and watch the skies. And while there, the spitfires buzzing above, I am quite sure they enjoyed a companionable fag. “Rene! Rene! Come and look at this,” my Dad called to my Mum. “Because I’m doing the washing-up!” she shouted back. Her tone of voice needs no qualification. I can just imagine it; in her mind it was something that HAD TO BE DONE at that moment, no matter what. But at the same time she wanted her boyfriend to know that she was deeply resentful - even if she couldn't yet put it in these words - of being stuck in this archetypal female role. So, that's the story. For all of my young life I thought my Mum missed seeing The Battle of Britain because she was doing the washing up.